Fans of old stuff seem to delve ever-backwards in time to find the earliest incarnations of what they enjoy. For instance curious fans of Star Wars might become interested in cliffhanger serials such a Buck Rogers and Flash Gorden, and WWII aerial combat movies to see where Lucas' influences come from. Fans of Superman and Batman might search out the pulps of The Shadow, The Spider and Doc Savage. But where did the inspiration for pulp heroes such and Doc and The Shadow come from? A rich young man loses his parents to a tragedy at sea. When trying to claim his ancestral home he finds the estate and even his family name stolen from him by his villainous cousin. 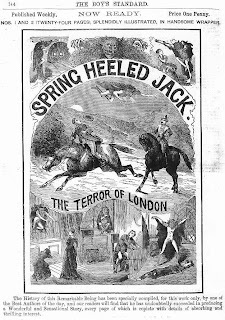 When fleeing for his life after a murder attempt Jack Dacre decides to create a costume and his Springed Heel apparatus in order to start a new life as a vigilante. So we have a rich kid who loses his parents, dips into madness and becomes a terrifying vigilante that uses gadgets to fight crime. Sound familiar? All that in the 1860s. You can read one rendition of the story here. 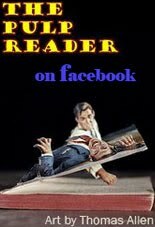 When it comes to the pulp heroes of the early to mid- 20th Century there are some names that repeatedly come up as the antecedents to that era's characters. The Scarlet Pimpernel, Captain Clegg (the Scarecrow of Romney Marsh) and Zorro to name a few. But in my opinion there are two that are more immediately accessible (and inspirational) to the pulp writers of the '30s and '40s . And they worked in ways that wind up being obvious inspirations to the heroes who follow. One of them is The Gray Seal (who in turn was probably inspired by European anti-heroes such as Arsene Lupin, Raffles and indeed probably The Scarlet Pimpernel). No, this is not an aquatic animal who you'd want to feed fish to. The Gray Seal was Jimmie Dale, a rich dilettante by day who for fun cracked safes at night. He also fought crime for the sheer moral righteousness of it. Much like The Spider and Batman he was always a razor's edge away from being caught as the bad guy by the official establishment; the newspapers and police. And also as The Spider would do (and other later imitators) he left the eponymous Gray Seal, a diamond-shaped gray sticker, behind at his heists and on the forehead of criminals he'd defeated. The Gray Seal had a mysterious contact, a woman who left cryptic notes which lead him from fighting one criminal to another. A story element that very likely influenced the 64 episode "Black Arrow" story arch of the Lone Ranger radio show. There's one character though that seems to me to really be the arch-prototype for all these guys and anticipated even Zorro and The Scarlet Pimpernel by a few decades. Strangely, out of this gallery of heroic grandpas, he seems to rarely get mentioned in this group. 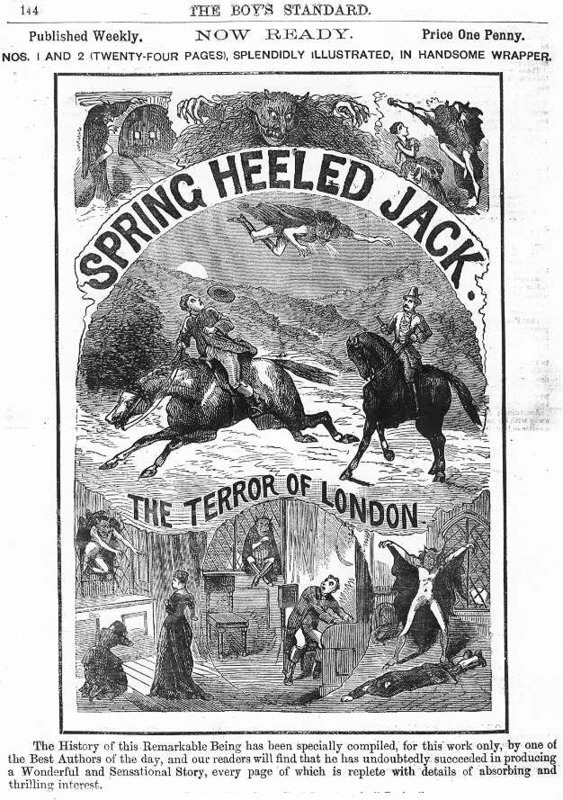 This American-born dime novel detective started doing his stuff even before Sherlock Holmes. There are surprising things about Nick Carter, Master Detective. Things I didn't know about because for some reason no one ever talked about it that much. Maybe it's because he is most famously known as "a detective". Which in the truest sense, he is not. He's a private investigator and consulting detective, but not on the police payroll. The things I found out were because I finally decided to start reading some of the original stories, which I think maybe most modern pulpsters haven't done. Probably because he just sounds like some old-timey book version of a Keystone Kop, and that may not be very interesting to readers who are into pulp heroes. Giants were like children in his grasp. He could fell an ox with one blow of his small, compact fist. Old Sim Carter had made the physical development of his son one of the studies of his life. Only one of the studies, however. Young Nick's mind was stored with knowledge--knowledge of a peculiar sort. His gray eyes had, like an Indian's, been trained to take in minutest details fresh for use. His rich, full voice could run the gamut of sounds, from an old woman's broken, querulous squack to the deep, hoarse notes of a burly ruffian. And his handsome face could, in an instant, be distorted into any one of a hundred types of unrecognizable ugliness. He was a master of disguise, and could so transform himself that even old Sim could not recognize him. And his intellect, naturally keen as a razor blade, had been incredibly sharpened by the judicious cultivation of the old man. 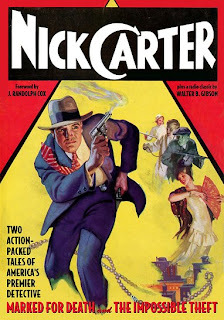 There are a number of facets of the Nick Carter stories, even in these early days, which suggests an unconscious influence on one of Street and Smith's later characters, The Shadow. The disguises, the separate identity maintained in another office, and later on (in 1905) there is a private room at police headquarters where someone waits at the end of a special communication line for word [from] Nick. The response, "On deck, sir!," to Nick's call was reversed to The Shadow's "Report," when he would call Burbank or one of his agents from his secret room. 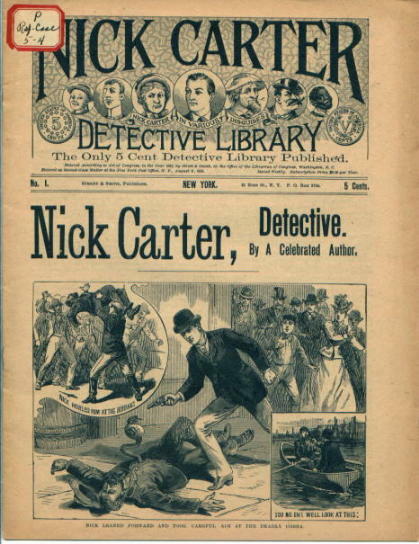 Likewise, the method Nick uses in Nick Carter Library #90, "9-19-29, or, Nick Carter and the Policy Sharpe," 22 April 1893, to assume another identity is suggestive of The Shadow. Nick sends a message to a known figure in Wall Street to "disappear," thus making it possible for him to replace the man without arousing suspicion. Even from the first Nick Carter that I read, I could see that he wasn't an everyday detective. He is super strong, able to knock out any normal opponent in a single blow. As mentioned above he's a master of disguise, able to change a complete makeup in just a minute or two. He's super intelligent and happens to be an expert in any subject under the sun that will help in his adventures, including swimming, running, fluent in many languages, great with gadgetry, weapons and so on. His adventures were more than mundane as well, encountering lost races in South America and the Himalayas, facing off against super criminals. Did I mention he's described as having "bronzed skin"? Of course one major difference between Nick and Doc is their height. Nick is five foot four to Doc's six foot eight. Appropriately Nick Carter's nickname was the "Little Giant". Are you pulp hero fans interested yet? There are several early Nick Carter adventures floating around in public domain. You can find some at Munseys here and here. Also, Anthony Tollin's Sanctum Books which has been doing an amazing job of reprinting Doc Savage and The Shadow is now starting to reprint the pulp version of Nick Carter. As opposed to the dime novel version. This is a big deal because even though most of the pulp heroes have gotten a good deal of latter day coverage through reprints, Nick Carter hasn't. 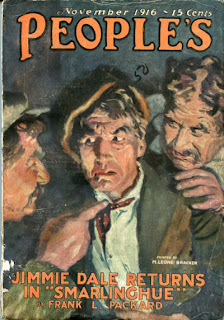 So now you'll be able to sample both the public domain dime novels and check out the pulps. 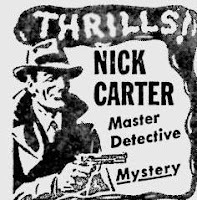 On an interesting note, the Nick Carter, Master Detective radio series had many of the early episodes written by The Shadow's Walter Gibson. You'll find one of those scripts along with a Carter comic in this first issue of Tollin's new reprint series. If you want even more info on Nick, check out Thrilling Detective and Nevin's webpage. 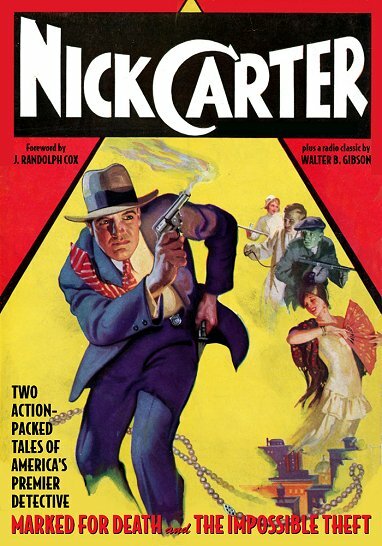 Also, though supposedly the same character, a long line of novels came out in the 60s and 70s called Nick Carter; Killmaster where he is a spy.